Please refer to our stock # 10331 when inquiring. A painter of historical, genre and allegorical scenes, Leeke studied at the Munich Academy under Johann Herterich and with the Hungarian genre and landscape painter Alexander von Wagner. Around 1889, Leeke was commissioned by Siegried Wagner, son of Richard Wagner to paint a series of scenes from his father’s operas to commemorate Wagner and his work. The series was completed in 1898. 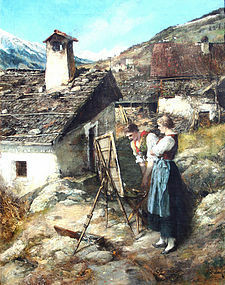 This scene of two young country women gazing at an absent artist’s canvas is set in the south Tyrol above Merano, Italy, near the Austria/Italy border. We know this because of a similar view of the same cottage titled “Schwarzplatterhof oberhalb Merans” (Schwarzplatterhof above Merano). The area is now a famous resort and vacation area. Thieme-Becker, ed. "Allgemeines Lexikon der bildenden Künstler vonder Antike bis zu Gegenwart"